The night air is deadly still. You are standing on the edge of a cliff waiting for dawn to break. Before you, a valley is covered in mist. Not to worry. The mist will rise and reveal what lies underneath. Soon, you spot first light on the horizon, rising from behind the silhouette of distant clouds and mountains. This will be pretty, you thought. And finally you look around you, only to find everyone else pointing their cameras in the same direction. Everyone will end up with the same shot. Now wait a minute...! 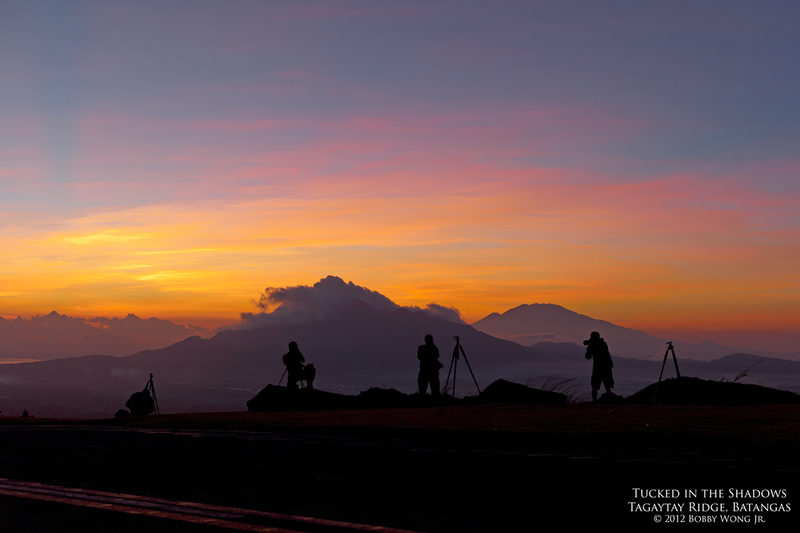 Along the Tagaytay ridge, the colors of dawn seldom disappoint. Every now and then, fog heavier than most will spoil it. But not today. It will be great. But what's so great about a dawn shot when four other dudes will take the same picture home? There's got to be another way... I quickly took several steps back and found a composition none of them will capture, because in my shot they're all tucked within the shadows waiting for dawn. Enjoy.